Zimbabwe Congress of Trade Unions Secretary General Japhet Moyo. The police have today arrested the Zimbabwe Congress of Trade Unions Secretary General Japhet Moyo in connection with the nationwide stay away that turned violent resulting in the death of over 12 people while property worth millions was destroyed. Moyo was picked up by police detectives upon his arrival at the Robert Mugabe International airport from China. 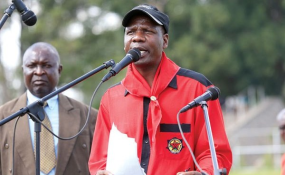 ZCTU President Peter Mutasa is reportedly missing since last week when his union called for a stay away to force government to address the plight of workers who are struggling against the high cost of living since the beginning of price distortions instigated by Finance Minister, Professor Mthuli Ncube who hinted at scrapping the local bond notes. Other prominent activists and union leaders arrested for the protests recently include Pastor Evan Mawarire and Amalgamated RTUZ leader, Obert Masaraure. The 14 - 16 January stay away turned violent when alleged opposition activists barricaded roads and while looting and burning shops.